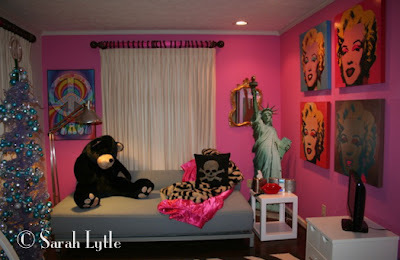 Sarah Lytle's granddaughter's new PINK bedroom! "Can you come help me paint," my friend asked? "My granddaughter is coming and I thought I'd have time to paint her bedroom walls, but I think I need help to get it done before she gets here." Oh, yippee! I love to paint. I really LOVE to paint someone else's house, especially when I don't have to pick the color myself! "What color," I asked? Not that it would make a difference as to whether I helped or not, but still, it somehow seemed important to visualize what I'd be doing. "Pink!" she replied. "Wink Pink." Now, this is a classy gal. Not the "typical" wife of a mid-west farmer or insurance salesman. Not that there is anything wrong with farmer's wives (or insurance salesmen's wives). I have a deep respect and admiration for them. But, I kinda visualize different colors when I think of a Kansas farmer's wife's walls vs a Santa Barbara California artist's walls. Pink can mean a lot of different things, after all. I look at a color pallet online and dream pink. "Secret Rendezvous", "Mediiterranean Spice", "Old Claret". Hum…… Where is Wink? So, off I head to paint. Pink. I'm imagining a form of dusty rose. But when I arrive and open the can - even I could see, she wasn't kidding. This is PINK! In fact, I recognize this color. I just helped my cousin paint her 11 year old daughter's room what had to be the exact same shade of pink. Megan, (my cousin) was not as thrilled with the idea of having this much pink in her house. But her daughter REALLY wanted it and, as I pointed out, it wasn't as though she was cooperating in helping her obtain a tattoo or pierced nose. This was paint - which can change next week if the daughter tires of it. So, I happily painted and then Sara came in and pulled the room together. Some Andy Warhol Marilyn Monroe's on one wall, a faux zebra-skin rug on the floor, a bright 60's-era peace poster, twinkle lights in the air and a 2' wide turquoise and lavender metal Christmas tree for holiday spirit. Oh, yes - and a phone that looked like a set of big red lips! It was a masterpiece. Made me want to run home and paint a room or two pink for myself - though I admit - I'd need her to come over to add the finishing touches. "Embrace color! Life is just too short for White Walls!" I commented last night but it isn't here. OH well just wanted to say color is beautiful. And hope Arayo is doing much better. I would call that Shocking Pink, not wink pink. It is, indeed bright! But, Wink is what they call it.